A few weeks ago, I was honored to be one of the keynote speakers at the 2nd World Parliament on Spirituality in Salt Lake City Utah. The timing couldn’t have been more relevant. Peace ambassadors from around the globe gathered to merge their collective wisdom of diverse spiritual thought for the purpose of increasing the level of love and peace in the world. No matter what side of the aisle you are on or how you felt about the recent election, there is no denying that this is one of the most pivotal times in history. On the surface, it seems like our nation is divided, but a positive outcome of the passion we’ve seen is that there is a cosmic shift. I believe we have reached the tipping point. People are finally waking up from their psychological and spiritual slumber. Voices that have been unheard are stepping up to the mic. And yes, some of those voices espouse separation cloaked in hate and intolerance. But many others stand out for peace and love. The ambassadors, participants and leaders of the world parliament on spirituality embodied the oneness that is the truth of who we are. Diversity in age, language, skin color and education, we gathered together and celebrated the underlying commonalities between us. We shared one goal: To recognize that we are all connected and to spread love, peace and understanding. Over half of eligible voters did not exercise their right to vote in the recent election. But in the ensuing weeks I’ve been struck by the waning of complacency. The most dramatic example in my mind is the outpouring of support and demand for the permanent halt of the Dakota Access Pipeline. And this week we saw what’s possible when you wake up and stand out for what is right. The Army Corps of Engineers ended work on the pipeline. I firmly believe that the energy behind it aided officials in making the decision. And then, two thousand veterans arrived in Standing Rock, and Wes Clark Jr. made a public apology to the Chief of the Lakota tribe. As he got down on one knee to make amends for the actions we as a nation have taken against these brothers and sisters, I knew that we will be alright. 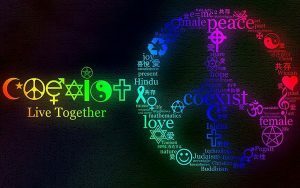 Love will prevail and peace will come. Let us continue to focus on what we choose that is working as opposed to pushing up against what is not working. Our power goes where our energy and focus goes. Let’s continue to stand out and focus on true peace within ourselves which will radiate out to others and create a peace and faith life to the planet.